Whether you are looking for a quick headache remedy, wanting to make the house smell like the holidays, spot an itch, or do a fun activity with the kids, Peppermint Essential Oil is a must-have! These 20 uses for Peppermint Essential Oil are sure to surprise you. For internal use, I recommend on sticking with peppermint tea and using the essential oil topically or in a diffuser. Internal use of essential oils has become extremely popular and due to my research, is no longer something I feel okay promoting. I like to err on the side of caution when it comes to matters of safety. If you like to add peppermint essential oil to your water for health benefits & flavor, try drinking a glass of peppermint tea instead! It's often said that 1 drop of peppermint essential oil is equal to 50 cups of peppermint tea and I know my body couldn't handle drinking that much for long without some serious side effects! As always I recommend you purchase a 100% pure oil. Insect Repellant: To naturally keep insects from invading your house, sprinkle peppermint essential oil and diatomaceous earth around the outside of your house. Peppermint Foot/Body Scrub: Mix peppermint essential oil with 1/2 cup granulated sugar, 2 Tbsp. coconut oil, and a couple teaspoons of glycerin to create a wonderfully scented and invigoration scrub. Fever Reducer: Place several drops in a carrier oil and rub on torso and forehead. Lime is also a great fever reducer, when you need to safely lower a high fever. Concentration/Alertness: Rub on temples, also you can just breath it in deeply straight from the bottle, or diffuse it. Homemade Peppermint toothpaste: Mix a dew drops with baking soda and coconut oil. Just don't swallow it! Nausea Remedy: Mix with a carrier oil and rub into your abdomen. Mice deterrent: Fill a small spray bottle with water, add 15 drops peppermint oil, spray in areas where you see evidence of mice. Allergy Relief: Fill a roller bottle with fractionated coconut oil add 15 drops each-peppermint, lavender, and lemon. Apply to temples and bottom of feet daily. Odor Control: Add a few drops to kitchen, bathroom garbage cans and anywhere else you need to neutralize and mask odors. Tick Remover: Place peppermint essential oil on a q-tip press into tick, when it withdraws somewhat, remove. Muscle Aches: Make a rub of peppermint, rosemary, lavender and coconut oil rub gently into sore areas, repeat several times per day. Cold Sore Medicine: Make a homemade lip treatment to quickly get rid of cold sores. Itch Relief: Apply oil directly to affected area. Motion Sickness: Add several drops to your collar before travel or on a piece of fabric to lay in the car. For children add a few drops to their car seat or blanket. Autism: Peppermint is a brain stimulating oil, and a newer alternative treatment is to apply to feet, wrists, place in a clay pendant or diffuse into the air daily. Hot Flashes: Fill a small spray bottle with water, add 10-15 drops essential oil, spray face and chest as often as needed. Sinusitis: Massage a drop or two around sinus area (avoid eyes) you can also inhale straight from the bottle. Safety Note: I'm just a mom that loves essential oils and has seen how beneficial they can be. I'm learning more each day about which oils are safe for children and pets every day. One thing I've learned is that peppermint essential oil is not recommended AT ALL for children under age 3. The menthol in peppermint can slow breathing and cause neurological issues in some children. For more information on how to use peppermint safely with children under age 6, I highly recommend reading this article on using Peppermint with young children. It's better to be safe than sorry with our loved ones! What is your favorite way to use peppermint essential oil? Do you have a use that is not listed here? Share it with us! 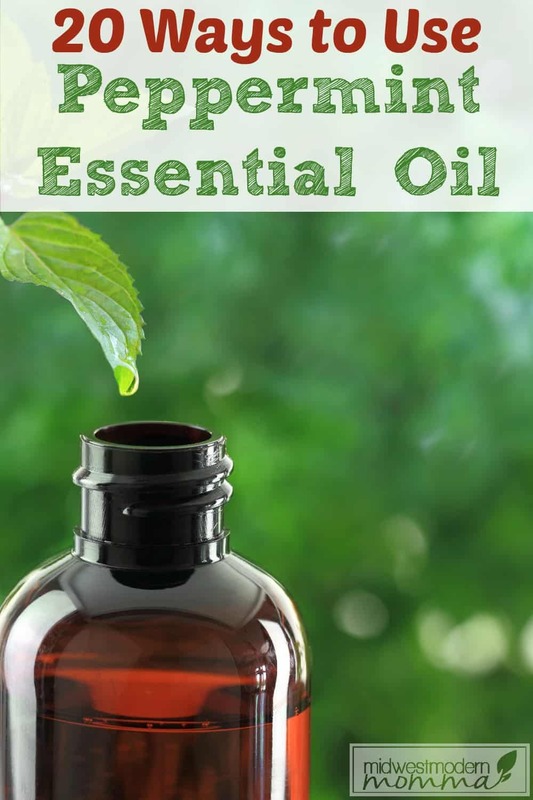 Don't forget to check out these 10 reasons you should be using essential oils!